The new Central Library in Finland will be a unique meeting place for all city residents providing them with cultural living room and a multimedia centre hosting a variety of events. It will also be one of the most prominent buildings in Helsinki thanks to its central location by Töölönlahti bay as well as its – by Finnish standards – progressive and unique architecture. 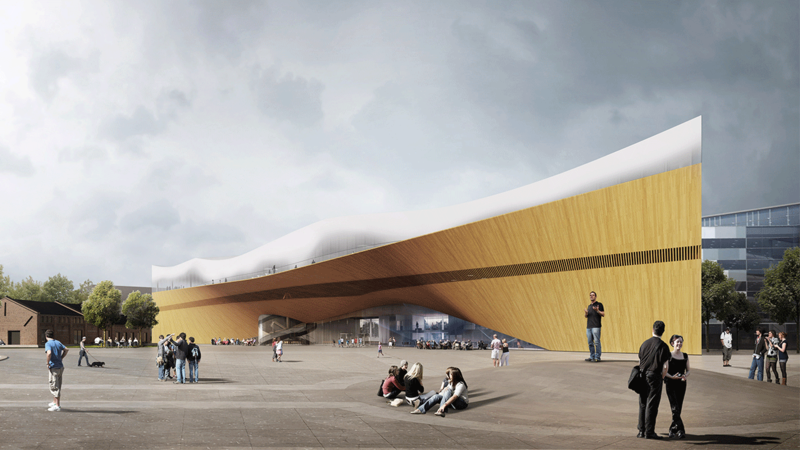 In terms of structural engineering, this multi-form and impressive library will be one of the most demanding projects carried out in Finland. As a structural engineer in the project Ramboll has solved major construction engineering challenges, such as a 100-metre-long bridge structure made of steel that forms the framework of the library building. This will be a first time such bridge structure is implemented in Finland. The library building is a masterpiece of structures made of steel and glass and it also meets energy efficiency requirements. It will be a nearly zero-energy building with a gross area of 16,000 m2. In the choice of materials and structural solutions the aim is for material efficiency. Its demanding framework combines steel and concrete, and the façade is an impressive symphony of glass and wood. Ramboll is responsible for building services planning in this project. The safe and tested electrical and HVAC solutions have been adjusted to unique structures. All design is coordinated with careful modelling. The library is estimated to be to some extent ready for Finland’s 100 year celebration in 2017, and it will opened for public in December 2018.